The table itself is finished and functional, though we will probably decorate and stain it to make it aesthetically pleasing. 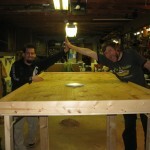 It’s a little bit taller (it’s 44″ tall) than we had initially planned on due to changing some of the plans as we went. Essentially, the wheels work by making sure the middle legs with the wheels would be sticking out when the sides folded down, so the legs had to be longer than the sides, which we made 3.5′ each (with a 1′ middle section).